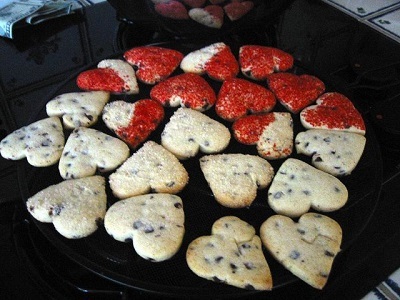 What better way to tell your loved ones how much they mean to you than by baking them a big batch of heart shaped cookies? Ok, there are some things that could be considered better – money, cars, twice as many cookies – but you must admit that fresh cookies are high up on the list. And this is one gorgeous batch of cookies, if I do say so myself. I made a basic cutout cookie recipe from Epicurious, a recipe I have used before to much success because it is tasty and very easy to work with. I mixed mini chocolate chips into half of the dough and, instead of using a cookie icing, I dipped the cookies in red and white jimmies, red sugar crystals and organic sugar. 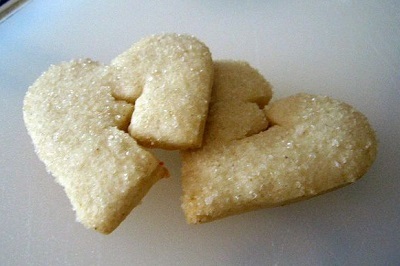 The organic sugar has much larger crystals than regular white sugar, so it looks much better on the cookie. 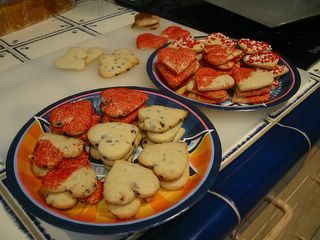 Spreading the sprinkles into a plate or into a shallow bowl will give you much more even coverage of the cookie surface. Most of the sugar will just fall off if you try to sprinkle it on. These cookies aren’t too sweet, even with the sugar sprinkles. Cream together butter and sugar in a large bowl. Beat in egg, sour cream and vanilla until well combined. Beat dry ingredients into butter mixture in two additions. Now is the time to add mini chocolate chips, if you’d like. Gather dough into two disks, wrap in plastic wrap and let chill in the fridge for at least an hour. Working with one disk at a time, roll dough out 1/8-1/4 inch thick. 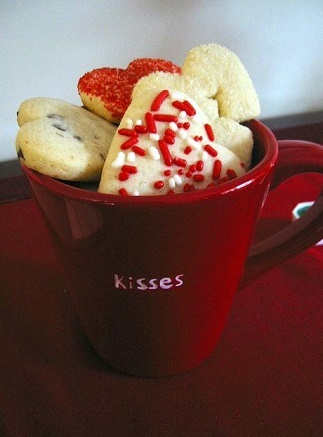 Use cookie cutters to cut to desired shapes. I don’t usually use very much flour when I’m rolling these guys, except for a little on the rolling pin. I do flour the cookie cutter, though. Gather scraps together, roll out again. Dip cookies into desired sprinkles when transferring them to parchment lined baking sheets. Bake until cookies are light golden around the edges, about 12 minutes. If your oven is uneven, rotate sheets halfway through baking. Notes: This made about 5 dozen cookies. The dough keeps well in the freezer, so I would recommend making the full batch and freezing leftover dough for another time if you don’t want that many cookies. They’re also fairly sturdy, so they’re a good choice for mailing as gifts. I don’t usually roll out any dough more than twice, but if you’re not using much additional flour, you should be able to reroll until all dough is used without toughening the cookies very much. Happy Valentine’s Day, guys (and girls)! Nic, these are adorable, and a very cute gift idea, too (from the girl who gave her man a 1 lb. bag of peanut M&Ms;-)! Thanks Moria. I wouldn’t judge peanut M&Ms harshly – they’re so addictive!